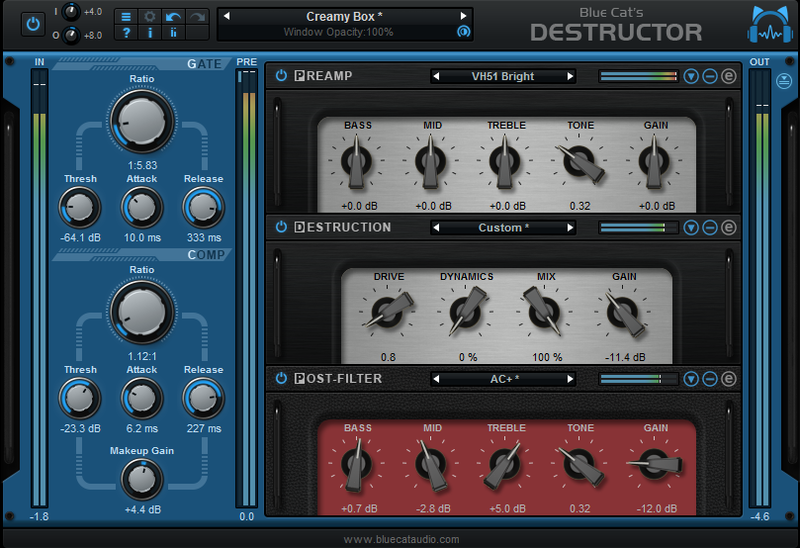 Our new plug-in, Blue Cat’s Destructor, will be soon available. So we thought you would be interested in looking at the “dark side of the plug-in” and know more about how it came to life, before getting your hands on it in a few days! Here is a Q&A session about this new plug-in with our founder and CEO, Guillaume Jeulin. Why yet another distortion / amp simulation plug-in in such a crowded market? It’s actually more than that… But the initial idea came up a couple of years ago while I was converting my guitar rig into a full “in the box” solution. I was not able to find any plug-in or hardware processor that could sound and feel like the real thing – I could just not get inspired when recording direct nor re-create the sound that I had in mind. After spending months tweaking every single parameter of all available simulations, I just gave up and decided we should build our own from scratch, and make it flexible enough to be able to use it on non guitar-tracks, and why not on the master bus! That’s how it all started. I think we’ve done a good job of it: I don’t use any other gear anymore, and not only for guitars & bass :-). What were the key design decisions for this plug-in? First, I really wanted something that would not only sound great but also provide a realistic feeling while playing. The plug-in has to be able to change its behavior depending on how you play it, just like your good old favorite gear outside the box. Second, in the real world or with most simulations, there are so many components involved that you can spend days choosing your amp, tubes, cabinets, microphones etc. When you are finally getting close to the perfect tone, just change one component and you have to restart from scratch, because it destroyed everything. And then, the mixing engineer will have to add EQs and compressors all over the place anyway, to make this huge sound of yours fit into the mix… I really wanted to get back to the bare minimal signal chain, so that it is very easy to get the perfect tone right away for playing, and you can quickly modify it afterwards when mixing. Last but not least, I wanted this plug-in to let you create your own tone, not just copy existing gear – and not be limited to guitar tones either. That’s why it is based on a perceptual model rather than electronics simulations or impulse responses: while you can still get close to existing gear with this approach (and it is usually a first step to get started), it is possible to go far beyond these limits and create something new. Is this plug-in only for guitarists, then? Definitely not. While working on it, it quickly became obvious that it was a much broader project than “just” an amp simulation for guitarists. It would eventually become a swiss-army knife for distortion and non-linear modeling. 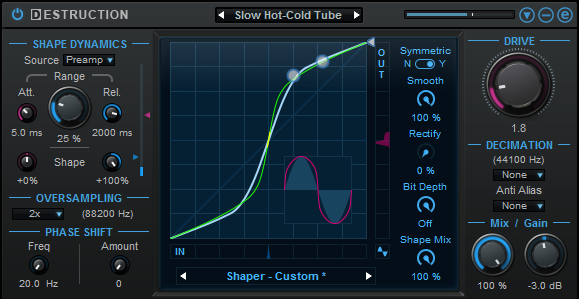 For example, the plug-in also includes bit crushing, sample rate decimation, phase distortion and multiple tweaking capabilities that you would not find in a plug-in for guitarists: it can even be used to emulate analog tape saturation or subtle tube compression to apply on the mater bus. 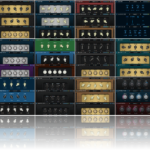 That’s why I like to call it a “distortion and amp sims factory”: it is flexible enough to let you envision a wide range of tones and applications. Just look at the list of factory presets to get an idea! What were the main challenges to build this product? As we all know, the devil is in the details… It took five years to build this product, mainly spent adjusting small things all over the place, and listening to the results for months before getting back to design. The main challenge for the DSP was this adaptive / dynamics shaping thing that enables the algorithm to adapt to the playing of the instrumentist. While the idea was here at the very beginning, it just took ages to tweak it: making it efficient and usable in most situations, and extending it to also create more subtle simulations for dynamics processing was like an odyssey! The second challenge was the user interface: with so many parameters and tweaking capabilities available, the initial prototypes where extremely complex to operate, and you could get lost very quickly. It took more than a year just to design the final interface, with its multiple levels of operation, sub-presets systems and custom visual styles. In the end, I think it was worth the trouble: you can now either use it in “simple mode” – just loading and adapting presets – or open all “edit” panels to tweak every single detail. And everything in between is possible. 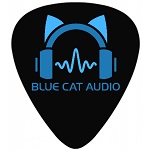 So, does Blue Cat’s Destructor REALLY go to 11? Yes, to eleven and beyond :-)! Numbering the drive parameter from 0 to 11 was obviously an easy joke, but more seriously, I think the plug-in really goes to 11 given its wide range of capabilities and the number of possible applications. I hope it will help musicians and engineers in search for the perfect tone explore beyond the limits of traditional simulations and create something new out of it! 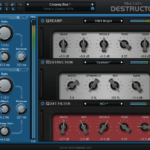 This entry was posted in Behind the Scenes, Community, New Releases and tagged Destructor by bluecat. Bookmark the permalink.